Hello and welcome to a guest post all about believability in writing. Followed by an excerpt from Susan Leigh Noble’s new release, Blood Bond. Just like watching that action scene momentarily jars you out of the movie, many things in your novel can have the same effect on your reader. I know that we are writing fiction, and anything can happen, but there still needs to be a level of believability. If your story takes place on Earth, there are certain things that people will take for granted – gravity, geography, travel time, etc. Readers may have knowledge of the professions of your characters or the locations of their travel. If you don’t know this information, you may inadvertently have something happen that jars the reader out of the story. The answer to this is to do research. You can talk with a fireman, visit a court trial, take a trip to New York City, or if you can’t do that, you can do research on the Internet. This research can add little details to your scenes that ring of authenticity and will draw your reader into the story. If your story has elements of science fiction and fantasy, you may be dealing with the impossible. But there are still ways to make your story believable. For one, your characters need to believe their world is real. If dragons exist or there is technology to beam someone down to a planet from a space ship, it shouldn’t come as a shock to the characters. Magic use to be prevalent only in fantasy novels but more and more, magic shows up in other genres, including romance and suspense. Magic can certainly enhance a story, but you need to make sure it is believable. If you make magic the answer to everything, there will be no conflict in your story. Instead, you need to define (at least for yourself) what can and cannot be done with magic and then stick to those rules. Being consistent with your details, whether they are about magic or the setting, can allow your reader to be immersed in your make-believe world, and you won’t jar your reader out of the story with something as ridiculous as a gun that never runs out of bullets. Thanks for the great advice, Susan. She regulary shares advice and writing tips on her blog Into Another World. So please pop over and have a look once you’ve checked out the book excerpt below of course. Susan’s new book, Blood Bond, was released on 6th February 2018. You can pick up a copy here. “You shouldn’t be bonded to Reddex.” Her voice reverberated within his head as she flicked her tail. “It wasn’t by choice,” he said, speaking directly into her mind. Before he could continue, Rakkah’s words sunk in and his bewilderment turned to anger. His heart pounded, and his shoulders shook. And then Dex was there. The red dragon faced Rakkah, slashing his own tail. Soren couldn’t hear anything but was sure words were exchanged between the two as they circled each other, their eyes locked. Suddenly, Rakkah leapt into the air and flew back to the other dragons. Dex turned to Soren. He didn’t wait to hear any more. Soren walked over to Warnox. With each step, his anger grew. He could still hear Rakkah’s taunting voice. She had been right. He wasn’t Dex’s first choice. He had lied to him about being the one the dragons needed. He shook his head as if to clear the thoughts away. But they persisted, and he quickly covered the distance to the other dragons and to his freedom. Suddenly, he dove toward the ground, flipping over in the air. Soren’s fingers tried to grasp onto Barth’s back but there was nothing to hold. He fell through the air. He saw Barth above him and then nothing but the blue sky as Barth Blinked. I hope you’ve enjoyed the guest post and excerpt today. Don’t forget to check out Blood Bond on Amazon US here and Amazon UK here. Susan Noble has always loved dragons and magic, so it is no wonder that she became an author of fantasy novels. As a cat lover, she also had to throw in a telepathic cat to the mix in her The Elemental trilogy. In addition to her trilogy, she has published The Search, a short story prequel to the trilogy and The Heir to Alexandria, a full-length standalone fantasy adventure. Her latest fantasy, Blood Bond, was released February 6, 2018. When she isn’t writing, Susan is an active volunteer in her neighborhood and at her children’s schools. She lives with her husband, two children, three cats and two Cocker Spaniels in Texas. 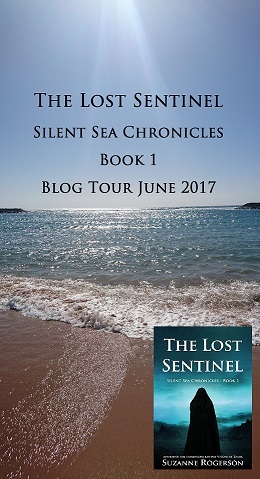 I’m really pleased to share this excerpt post for The Lost Sentinel’s blog tour. A book review follows, also from Book Savvy Reviews. I hope you enjoy. Hello! Thank you for visiting Book Savvy Reviews on this book tour! Enjoy your stop here. I’ll be posting a review as well as an excerpt from The Lost Sentinel. I’m really pleased to take a break from my own blog tour to introduce Jaye Marie and her book The Broken Life. Both Jaye and Anita have been very supportive taking part in both my blog tours, so it’s a real pleasure to return the favour by being their host on the blog tour today. I have a very exciting excerpt to share, but first here’s a little about the book. David Snow knew he was in trouble. No one had come when he used the trigger word, and Ruth Winton had shot him twice. She must be using specialised bolts for they had both penetrated the protective vest he was wearing as if they were made of paper. Luckily, there didn’t seem to be much bleeding, but it hurt like hell. The other pain in his chest, the one that had chosen this particular day to reappear seemed to be ebbing, leaving him breathless and weaker than he needed to be. He realised he was on his own. Something had gone wrong; the back up he was relying on wouldn’t appear to save the day. He wondered what if anything he could do about it. Hardly in a position to contemplate doing anything, he thought, smiling on the inside. He opened his eyes a little, just enough to see where Ruth Winton was and found her standing a few feet away from him. The crossbow was lying on the floor, and she was staring at him, but she didn’t look angry. If anything, she looked sad. So when she started to walk towards him, he wasn’t worried. She knelt down beside him and held his hand. With the other hand, she touched his face. ‘Are you all right, daddy?’ she said, her voice small and childlike. Realising something else was going on, he said nothing, not wanting to stir the hornet’s nest. It was imperative that Ruth stay where she was now, but even as he thought it, he could sense her mood begin to change. The grip on his hand became tighter, and he could feel the tension vibrating her body. She stood up and walked away from him, picking up the crossbow as she made her way up the stairs. Snow struggled to sit up, needing to check his phone. It was switched on, but there was no indication it was working. He stabbed at the buttons, unable to believe the trouble a small malfunctioning machine could cause. How long would his back up team wait? Round about now would be good, people, he thought. Not convinced that help would arrive anytime soon, he wondered what he could do. He wasn’t even sure if he could do anything, skewered front and back as he was. But if he wanted to survive this, he would have to try. He soon discovered that any movement, no matter how slight, caused the pain radiating from both wounds to intensify. This didn’t make him want to stop or give in, just made him more determined than ever to leave this house on his own two feet. He edged his way up the wall until he was standing upright. Now what? Could he walk? He looked around for something to use as a weapon and took a step towards the kitchen. A quick look in the drawers revealed they were empty. He had to think of something and quick. She would be coming back down to finish him off at any minute. A thought occurred to him. Could he pull out the bolt in his chest somehow? Was it even possible? He touched the end of the bolt, only to discover it was smooth and slippery, no obvious means of removal. There were small ridges, but not enough to help him. A pair of bright yellow rubber gloves lay on the draining board. Not something that belonged in his kitchen, but a welcome sight. He grabbed one and wrapped it around the bolt, gritted his teeth and pulled. The pain level sharply increased, but he kept on pulling. It didn’t seem to be working. It was beginning to look as though he would die in his own kitchen after all. Noise from upstairs made him try harder, and this time he thought he felt movement. His head was screaming with the pain, but this only served to increase his determination. Somewhere behind all the pain, he knew it could be a waste of time anyway; he wasn’t likely to get close enough to use it, not with the crossbow in her hand. He heard footsteps on the landing. She was coming! With one last effort, the bolt left his chest with a small squelch, and he looked at it in his hand. No more than eight inches long, so small and yet so deadly. He thought of all the people she had killed, of Jim Harris, his best friend and his anger finally flared. He was experiencing all kinds of pain now, and the wound in his chest was bleeding. He didn’t understand how he was still standing. Maybe that would work, he thought. Would she still fire if he were lying down, maybe dying? The Broken Life is only 99p during the blog tour, so don’t miss out on picking up your copy today. My name is Jaye Marie, the ‘oily rag’ of the partnership http://jenanita01.com/ and usually, I prefer to stay in the background. Since we decided to publish our books ourselves, most of my other interests have had to take a back seat, and as I am not half as clever as I want to be, they may well have to leave the country for a while. Well, some of them can but not all. I am an avid Bonsai fan and have a collection that demands my attention in the growing season, or they will die. (It is a bit like having children) I love books and have read my way through stacks of them, so when my sister needed someone to edit and type up her manuscripts, I was happy to help. Somewhere along the way, I discovered my vocation and my love-hate relationship with the world of computers. But I did learn how to edit and proofread, taking over the job of getting Anita’s books ready for publication. I even had some wonderful compliments from one of the best literary agents in London for my editing of Anita’s first book, Bad Moon, and for the last twenty years since my retirement, that‘s what my life has been like. Please join Cathy for an excerpt from The Lost Sentinel on day 5 of the blog tour. The book is released tomorrow, but you can pre-order now for 99p. It’s day 13 of the blog tour and I’m really happy to share this brilliant review of Visions of Zarua, plus one of my favourite photo quotes. Please head over to Happymeerkatreviews. I’m very pleased to be the featured author on Into Another World’s blog this week. Please welcome to my blog author Suzanna Rogerson. Her book, Visions of Zaura, is currently special for $1.99 for a limited time. Please tell us about your current release? Visions of Zarua is my debut fantasy novel, which I self-published in November 2015. The novel focuses on the interlinking stories of two wizards who live 350 years apart. The first is an apprentice wizard named Paddren who’s been plagued by visions of death ever since he was a boy. The second wizard, Jago, is a junior wizard who lived 350 years before Paddren’s story begins. Jago returns to Zarua after a five year absence to find a dark undertow sweeping through the city. But the Elders refuse to believe Zarua is under threat, a mistake that has far reaching consequences. Both wizards must fight to save the realm of Paltria from the dark menace of Zarua’s past.